Virtualization has become a �megatrend��and for good reason. Implementing virtualization allows for more efficient utilization of network server capacity, simpler storage administration, reduced energy costs, and better use of corporate capital. In other words: virtualization helps you save money, energy, and space. Not bad, huh? If you�re thinking about �going virtual� but have the feeling everyone else in the world understands exactly what that means while you�re still virtually in the dark, take heart. 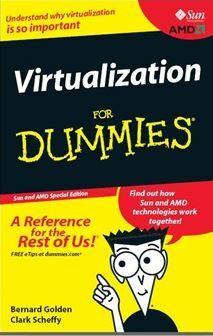 Virtualization for Dummies gives you a thorough introduction to this hot topic and helps you evaluate if making the switch to a virtual environment is right for you. This fun and friendly guide starts with a detailed overview of exactly what virtualization is and exactly how it works, and then takes you on a tour of the benefits of a virtualized environment, such as added space in overcrowded data centers, lower operations costs through more efficient infrastructure administration, and reduced energy costs through server consolidation. Whether you�re an IT manager looking to sell the idea to your boss, or just want to learn more about how to create, migrate to, and successfully manage a virtualized environment, Virtualization for Dummies is your go-to guide for virtually everything you need to know. Bernard Golden has been called �a renowned open source expert� (IT Business Edge) and �an open source guru� (SearchCRM.com) and is regularly featured in magazines like Computerworld, InformationWeek, and Inc. His blog �The Open Source� is one of the most popular features of CIO Magazine�s Web site. Bernard is a frequent speaker at industry conferences like LinuxWorld, the Open Source Business Conference, and the Red Hat Summit. He is the author of Succeeding with Open Source, (Addison-Wesley, 2005, published in four languages), which is used in over a dozen university open source programs throughout the world. Bernard is the CEO of Navica, a Silicon Valley IT management consulting firm.